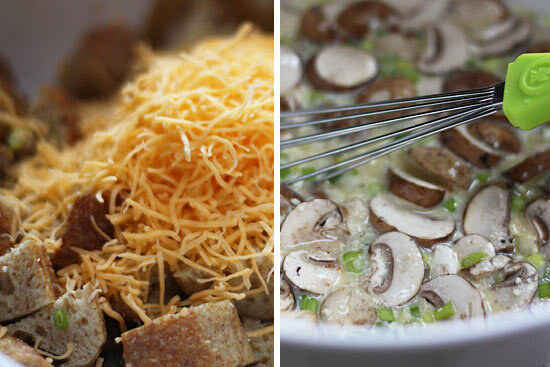 A make-ahead breakfast casserole made with day old bread, eggs, cheese, sausage and mushrooms. You can make this with just about anything, just use your imagination! This recipe from the archives is perfect for Christmas morning so I thought I would revive it to give it some attention. More great holiday breakfast and brunch ideas and sides are Spinach, Feta and Artichoke Breakfast Bake, Sausage Cheese and Veggie Egg Bake, Sicilian Rice Ball Casserole, Scalloped Potato Gratin, and Sauteed Brussels Sprouts with Pancetta. Breakfast stratas can be pretty high in fat, generally using at least 8 eggs and 2 to 3 cups of cheese. To lighten this dish I used less eggs, turkey sausage in place of pork sausage, fat free milk, reduced fat cheese and whole wheat ciabatta bread. You can easily swap out the mushrooms for asparagus or bell peppers, use ham instead of sausage, and make it with any cheese you like. Enjoy, whatever flavor combination you come up with!! Arrange bread cubes on a baking sheet. Bake at 400° for 8 minutes or until toasted. Add sausage to pan; cook 7 minutes or until browned, stirring to crumble. Combine milk, cheese, eggs, egg substitute, parmesan cheese, paprika, salt and pepper in a large bowl, stirring with a whisk. Add bread, sausage, scallions and mushrooms, tossing well to coat bread. Spoon mixture into a 13×9-inch baking dish. Bake at 350° for 50 minutes or until set and lightly browned. Cut into 8 pieces; serve immediately. The recipe says “serve immediately”. I was thinking about making this as my meal prep for the week. Would this not stay good in the fridge for the week? Wondering if you could mention that this has been updated for Freestyle or not? I am sure you are getting a ton of questions, but since the points are higher and the eggs are free, it’s just hard to tell. I think you have done a fantastic job updating, and I thank you very much. Everything has been updated! There’s bread and cheese in here making it higher. Thanks so much for the quick response! I just made the chicken and white bean enchiladas last night, crock pot Santa Fe chicken the other day! You’ve helped me lose 30 pounds and keep it off! I love that you don’t use condensed soups and fake foods! My pleasure and so awesome! Am I missing something with your new website: not seeing the old PRINT FRIENDLY button from the old site or any PRINT button for that matter. Old eyes? There’s a black print button below the recipe. What is best method to reheat leftovers (there are only two of us and even if we bake in 8×8 pan and cut in 4 pieces, it will be too much. Microwave or heat in oven at low temp covered with foil so it doesn't dry out? Can this freeze and then be reheated? Alicia, I have personally made and frozen this recipe dozens of times–it is one of my favorites and a go-to for when we have house guests. Since my family currently just includes my husband and myself, I usually make this recipe in 2 8×8 pans instead of the 13×9–I typically bake one pan for us to have, and freeze another pan (fully assembled but unbaked). The previously frozen pan bakes up beautifully: just thaw overnight in the fridge, let sit at room temperature for about 30 minutes, and then bake as directed. You can probably skip the room temperature sit if pressed for time, but I learned that tip from a cooking magazine and found it does help the strata puff up. This was fantastic! I made this christmas morning and again this past weekend. I tried to find whole wheat ciabatta bread, no luck, ended up using french both times. Still turned out WONDERFUL. I will eventually find the correct bread and make this again, but this is a keeper. Thank you so much for all your recipes, makes being on WW so much easier! I've been wanting to try this but have a gluten intolerance, so I tried it with gluten free light rice bread and it was delicious! I used turkey sausage and red peppers and onions.The bread was not good normally but after toasting and marrying with the rest of the ingredients did quite well. Thanks Gina. Gina, what is the reaon for using part real eggs & part egg beaters? flavor, consistency, texture? I know the egg beaters are less points, so why not use only that? This was a wonderful brunch recipe for Mother's Day this year! In past years, I always made an "old family" strata for Christmas Day. This new recipe was so yummy. From now on, this will become our "go to" strata for any brunch. Thank you. This was VERY yummy. A hit with the whole family, which is sometimes hard to do. Thank you! I'd prefer to use real eggs rather than egg beaters. What do you think would be best for proportions of egg white vs. whole egg? I looked at the ingredients for egg beaters and it's 99% egg whites plus some weird stuff like coloring. So I'd just measure out 12 oz of egg whites. Hi Gina! 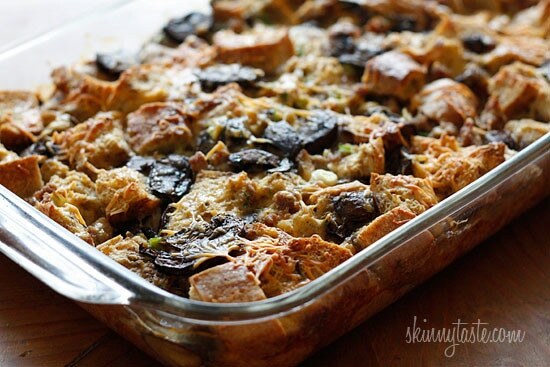 I have company coming in town tomorrow and was hoping to make this strata recipe and your lighten up creme brulee french toast casserole for a brunch buffet for them. That being said, I have a bunch of frozen Italian bread and Frozen sourdough, but they are sliced at about 1/2 inch thick slices. Do you think I could use either of those loaves to successfully make this strata (and the french toast recipe? ), and if so, should I adjust how many of the smaller slices I use or anything? Thanks!! Thanks for sharing :). It makes me think of a similar casserole I make. It's almost identical, but instead of the bread I substitute 2 shredded medium zucchini. You'll have to cook it a little bit longer because of the additional liquid. I'll have to try it with bread. Could you make this and then freeze it to enjoy later? I'm looking for a good breakfast recipe that I can make in advance for a cabin trip! Is it 1.5 cups cheddar or just .5 cups? It looks like 1.5 but then says 4oz, which is .5 I think?? this is SOOOOOOO delicious! we had it tonight and it was so very amazing. for the record, we made it ready to put in the oven and didn't leave it in the fridge for a day and it was still super good. i am sure the breading might have more flavor if it sat for a while, but i was glad it came out great regardless! I made this for Christmas breakfast. Substituted asparagus for the mushrooms. And served with mixed fruit. This strata was so flavorful and everyone was impressed! My stepdad even commented that it was gourmet! This is going to be our Christmas tradition for years to come. Thank you! This was wonderful! We enjoyed it on Christmas morning. Sad to say that not a bit was left over. I am making this for Christmas brunch. I am making two versions – one gluten free and meatless and one with sausage and cheese. For the gluten free one I am toasting Udi's brand gluten free bread with asparagus and other veggies I have in the fridge. Can't wait to try it. WHY ON EARTH haven't you made a cookbook yet? Just to say thank you for all the recipes this year and previous years. I only seem to go here and always find something. Thanks for all the hard work. Have a great Christmas with your family. And thanks again. oh, this is great! i think i just found a go-to christmas morning recipe to feed my hungry family. i love using chicken sausage available at Trader Joes, so thanks for sharing the recipe. have a very happy holiday! I've made the King Arthur Strata recipe the last few Christmases, and they're so delicious and versatile. I noticed you used 3 real eggs and then the remainder egg substitute. I've always just used egg substitute. I'm curious why you do a mixture. Flavor? Texture? Personal preference? Thanks! 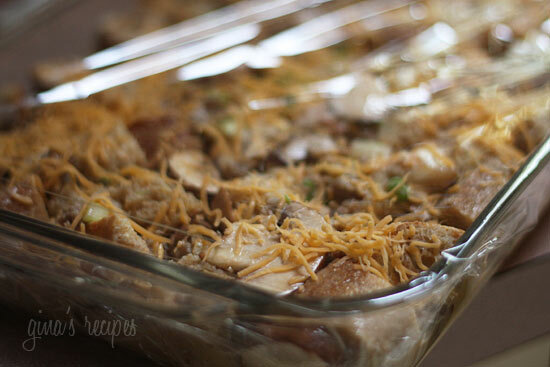 Does the casserole have to sit overnight or would it be ok to make it in the morning? looks wonderful! I'll be putting in the egg beaters to reduce the cholesterol. I love reading everyone's take on your recipes too. The chock full of veggies version looks really good with spinach. Oh yum! This looks wonderful!! Breakfast is my favorite meal of the day and my family doesn't like to eat breakfast! Stinky! I would so make this! Whole wheat ciabatta bread?? I have never seen that. Did you go to a bakery or do you think it can be found in a regular grocery store? You seem to be a step ahead! 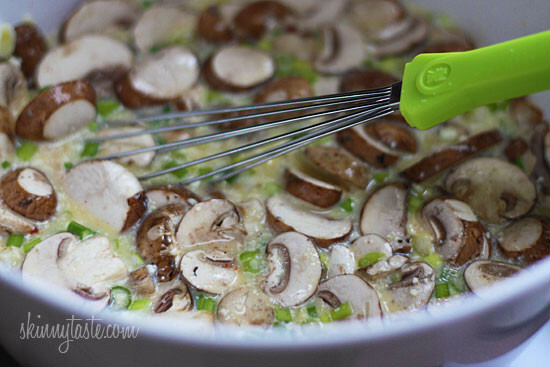 I had a delicious breakfast casserole this past weekend made with the cream of mushroom soup. I loved it but I'm sure more calories than I want to calculate. I'll try this one. More up my alley. Thanks again Gina. I'm not sure how that would turn out, it wouldn't be a strata without bread. can you use oats or quinoa instead of bread…? would there be a cooking time diff or recipe change? I made this for our nurses week brunch… Everyone loved it! Thanks so much! I made this with crumbled soy chorizo and it came out AMAZING. so flavorful! Thanks for another winning recipe. I made this Sunday and it was delicious! I couldn't find wheat ciabatta so used white. It makes great leftovers and would be good with just about any sausage/veggie/cheese combo. Thanks for a great basic recipe for many improvisations. Yikes! You can't mix diets, it doesn't usually work. No carbs, this is not the right recipe. Adding more sausage I'm afraid will increase the points. You're better of making a fritatta instead. Low carb and low points if you use egg beaters and lots of veggies. Gina, I'm trying to make a strata that would meld well with a couple different people on different diets. One, no carb. The other WW. I was wondering if I could cut the amount of bread and up the turkey sausage and have this come out good? And points? What do you think? Need to make it this Friday morning for Sat. morning retreat. Thanks for your help. This looks fantastic. We always have strata for our Christmas brunch. Also a veggie dish with roast corn from a summer beach fire. We add diced peppers and onions to the corn and have a taste of summer with our Christmas celebration. I am doing this recipe right now and am stuck! I've cooked the sausage, but don't know where/how to add itto the rest of the dish. 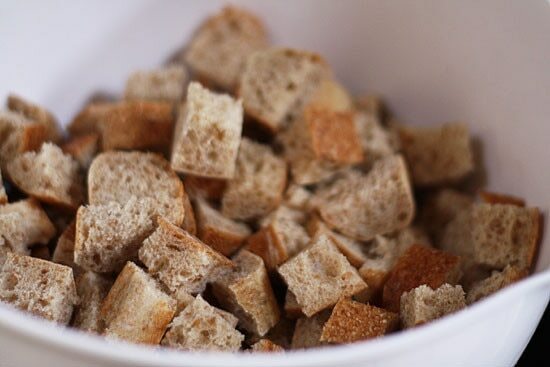 Does it mix with the wet ingredients or the bread cubes? For the 8 oz of bread, the total was fat -2, carbs – 108, fiber 8, protien 20. Old points without the sausage is 4 points. Points+ 5. I love strata so thanks for posting. Now that I'm back on WW again this definitely seems like something worth trying. I don't think I'm going to be able to find wheat ciabatta bread, (Chabaso) where I live. Could you give the nutritional information on the bread, so that I can find a substitute with similar stats? Thank you! Just wondering: How many points (old points) would it be if we cut out the sausage? I should add, the portion size was large! So if I were doing this for Christmas, I would also serve some fresh fruit salad (free!!) coffee for sure, and cut the portions smaller, maybe into 12 pieces. Less points! I have been making strattas for Christmas morning now for a few years! I posted a recipe for one using some reduced calories multigrain bread as the base on my blog a few weeks ago, and was happy with the points and how it tasted. Srattas are great, because you can substitute any combo of meat and veg you like, and you can't beat the make ahead feature! This one looks really yummy! THANK YOU! We do a pretty lovely Christmas brunch and eat while opening presents. 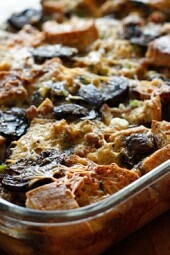 I said I would bring a strata, and after reading this recipe I think this will be it! I loooove stratas. I've done a few versions lightened up too–love the sounds of yours! Oh yummy, yummy! Was looking for something to make for hubby's birthday breakfast this coming Sunday. Mmmmm. You just read my mind!! I have been searching high and low for a low point breakfast casserole! It's our tradition to have one every year on Christmas morning, and I was feeling a little anxious about how I was going to fit those points in! Can't wait to try it! Thank you for this and all of your recipes!